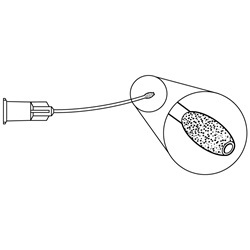 Disposable Olive Tip Cannulas range from 23 gauge to 25 gauge in size and are available with angled or curved shafts. Each cannula has a 1mm sandblasted or smooth bulbous tip. Sold 10 per box. 23 gauge, curved shaft. Smooth tip. Overall length: 22mm. 23 gauge, angled shaft, 10mm from bend to tip. Sandblasted tip. Overall length: 22mm. 23 gauge, curved shaft. Sandblasted tip. Overall length: 22mm. 25 gauge, curved shaft. Sandblasted tip. Overall length: 28mm.